Perhaps you watched the Belmont Stakes yesterday. It certainly was exciting to watch California Chrome go for the Triple Crown. But did you know that there was also another even more exciting sporting event involving furry four-legged creatures going on around the same time? Just a little down the street from the Santa Anita Racetrack in Arcadia, California, where California Chrome won a few races, the Basset Hound Spring Games (or as I call it, the Basset Hound Olympics) takes place annually every spring. 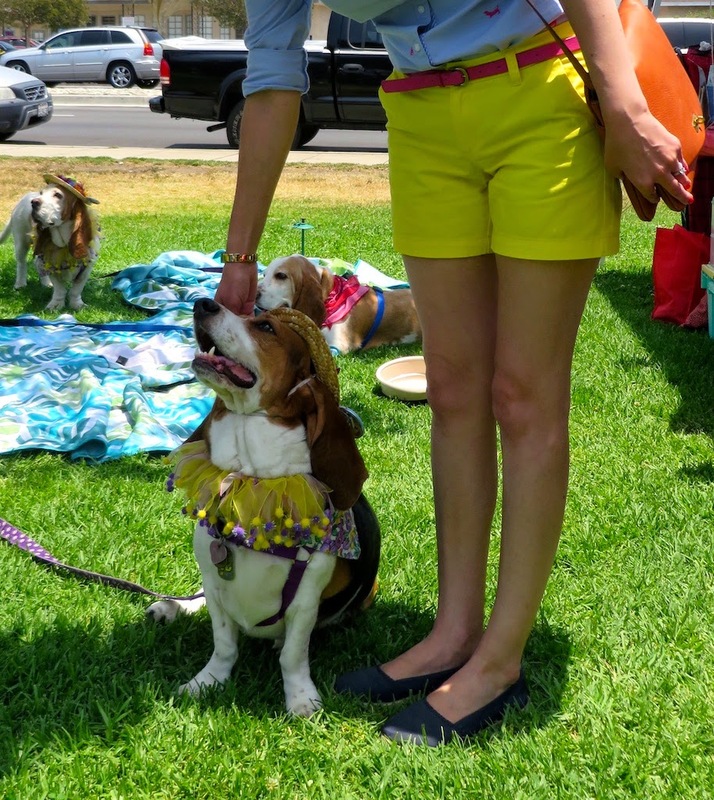 The event, which includes many Basset Hound festivities and games, is held to raise money for homeless Basset Hounds of Southern California. Huell Howser even covered the games on one episode of California's Gold, and despite the fact that I am not a Basset Hound owner, I somehow end up going every year to watch the pageantry of Bassets competing in events like best howl, most drool, "swimming", obstacle courses and more. I actually have a few Basset related articles of clothing, including this button down from Tommy Hilfiger. It features embroidered pink Bassets sniffing around all over, so figured it would be perfect to wear to the Basset Spring Games. Plus you can wash it, which is good since Bassets drool a lot! So enough with the Basset inspired fashion. 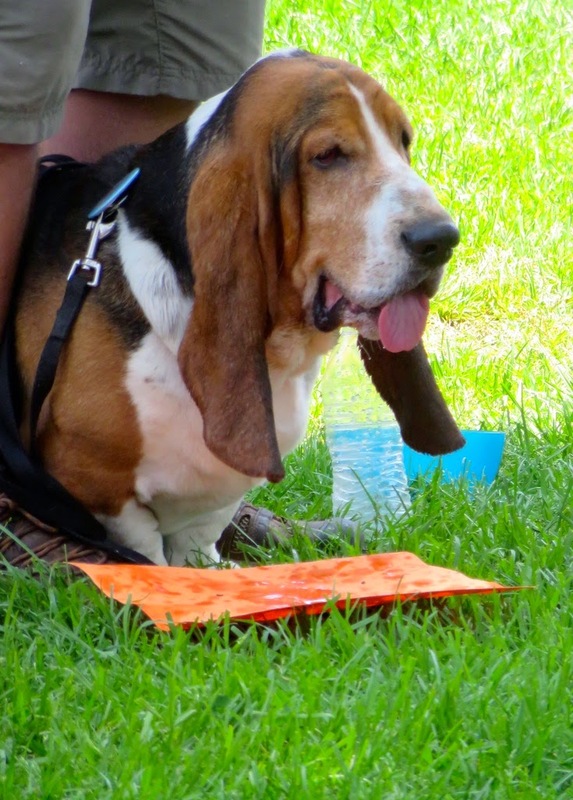 Below you will see some of the pictures from the Basset Hound Spring Games/Olympics. It is quite the fun event if you're a Basset lover or just a dog lover. I've always thought people should go back to wearing more hats; it's just so glamorous. These hounds certainly have the right idea! 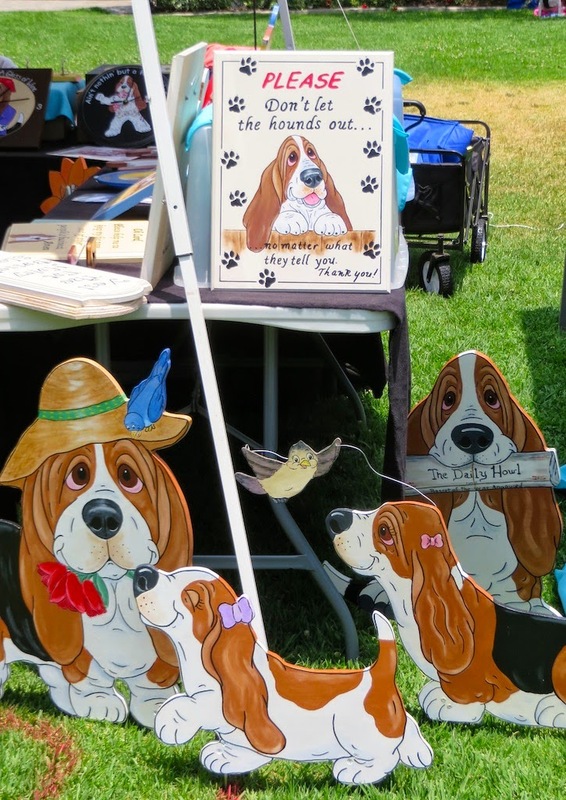 There were some vendors selling Basset themed items, including the above signs. 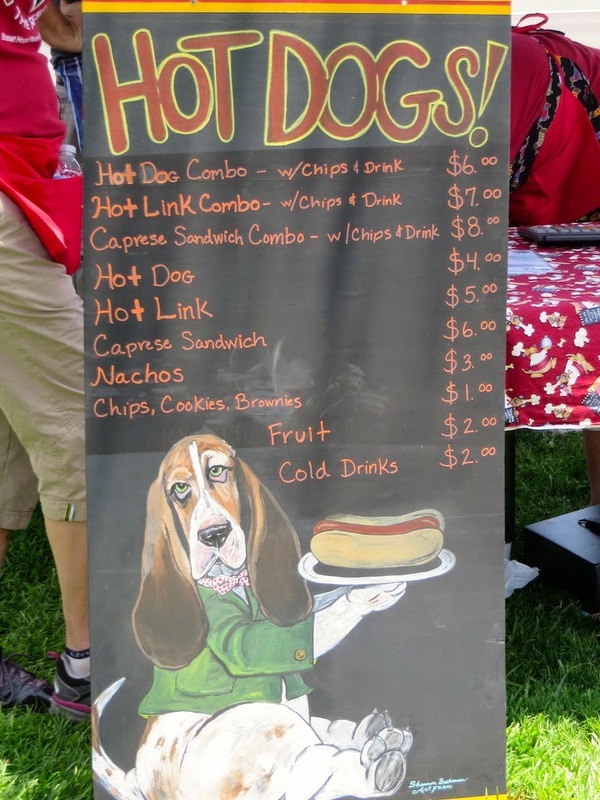 Yummy food is also sold to raise money for the hounds. I had the Caprese sandwich and it was delicious. My husband had a hot dog. Here is a Basset obstacle course, which proved to be quite the challenge for most of the hounds present. William, my English Springer Spaniel, would make short work of this. In fact, he has taken a few doggy agility classes as he's quite the natural athlete. Basset trying to get up a ramp. Basset that eventually made it to the top of the ramp. This Basset is contemplating if he should go in the pool or not. Perhaps he is afraid to get his cowboy hat wet? I don't blame him, fashion should always be one's first priority! My favorite of the competitions was the drool contest. Basically, they put a piece of colored construction paper under each Basset's mouth and let them salivate over treats for 90 seconds. The Basset who makes the biggest mess is the winner. Above are two of the finalists. Well, I hope you enjoyed these lovable hounds as much as I did. William was not happy when I came home smelling of other dogs, but I think he'll get over it. It was hard to resist playing with, petting and fawning over these lovable Bassets! Hah oh my gosh this looks like something I would totally attend. Do you think they have them for Corgi's? I totally want one. Anyway. 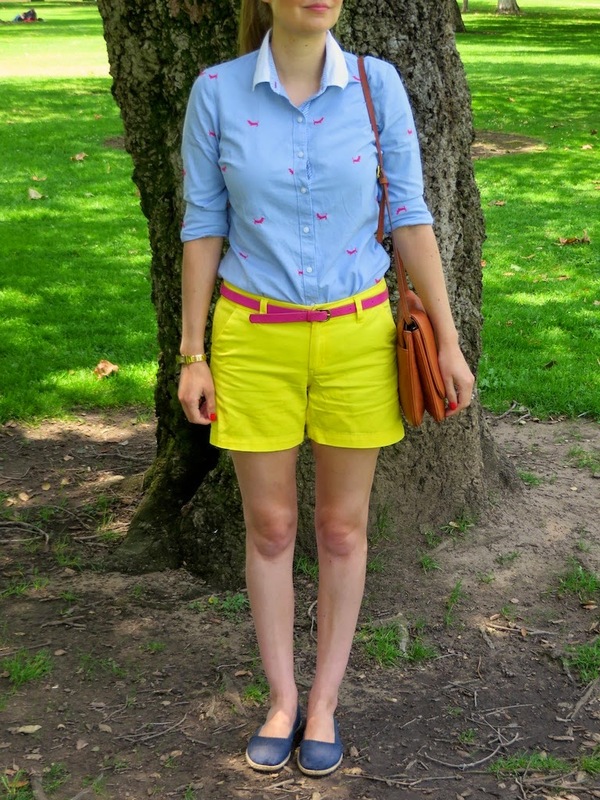 Your outfit is just too adorable - I seriously love how you mold your outfits to the event you are at. And your shoes - what are they? I loved everything about this post! I don't think they have a Corgi "Olympics", but that would be awesome! I love Corgi's with their little legs. I always laugh when I see Queen Elizabeth with her small pack of Corgi's following her everywhere! Anyway, my shoes are from Target. I bought them last year. I was hoping that they would bring them back this year because I wanted to get more colors, but sadly they didn't. They are my favorite summer shoes! Aw, what a cute pup event!